← Chocolate, Spring and Easter – Oh My! Here comes Peter Cottontail. . .
. . .and the results of our Easter Basket poll. Easter is April 5th this year, less than a month away. Can you guess what most people want to find in their Easter basket this year? YOU guessed – the big chocolate Easter Bunny was the treat of choice (71%)! We want to thank all of our loyal readers for participating in our poll. Your input greatly contributes to the choices that Chocology makes. 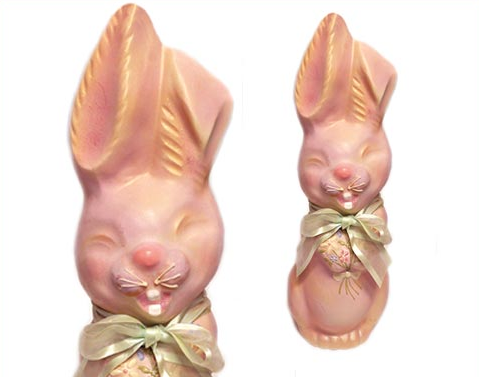 Rest assured, chocolate bunnies will be among our Easter offerings this year. We’ll announce our line of Easter products on Facebook in the coming days, so be sure to check there often. 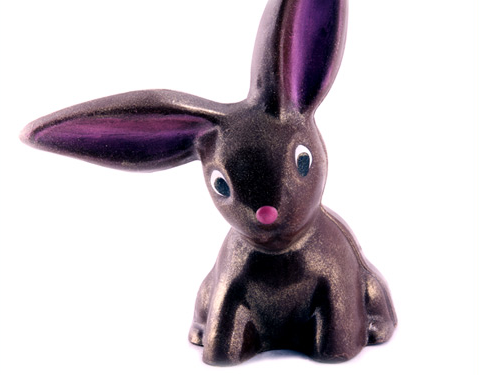 In honor of your vote, we decided to find out what part of the chocolate Easter Bunny people like to eat first. Is it the ears or the tail? Or, perhaps it’s the feet? In a recent study, over 76% of people said they eat the ears first. Does it really matter which part of the bunny you eat first? Well, we’re not sure – but according to the Cowboy Country website as well as the Women’s Lifestyle website, the portion you eat first says a lot about your personality. Do any of these personality traits match your bunny eating style? Breaking the chocolate bunny in half is pretty much how you live life, “half full” being a bit skeptical or pessimistic about things. However you have a purpose in life, of making others feel like they have it better. This is not necessarily a bad thing, you like being a pessimist, and some find your pessimism a bit humorous. Whether you break your bunny in half or smash your bunny to bits before you eat it, one thing is sure – it all tastes delicious! That’s why Chocology is going to give away a solid 5 pound, 2 foot tall white chocolate Easter Bunny this year. Retail value for this delectable treat is $130. It just might take you all year to devour this chocolate giant. Are you one of the 76% of Americans that will eat the ears first? Tell us which part of the bunny you’ll eat first on Facebook, Twitter or in the comments section. We’d love to know your bunny eating personality! …Hopping down the bunny trail! This entry was posted in Uncategorized and tagged 76% Americans, Big Bunny, Bunny, bunny trail, chocolate, country cowboy, decadent chocolate, delectable, Director, Easter Chocolate, Easter Poll, Facebook, fine chocolate, Giant Easter Bunny, Peter Cottontail, recent study, twitter, women's lifestyle. Bookmark the permalink.